Undoubtedly climate change (CC) is causing extreme weather events to occur more frequently and with more intensity. However, in reviewing the recent disasters, it can be seen that there remains a number of weak links in the "chain" of CC response and disaster risk prevention, from forecasting to disaster planning and the execution of response measures. Flash flood wipes out a range of houses and facilities in Residential No. 8, Mu Cang Chai town, Yen Bai province, at dawn on August 3. According to the latest data released by the General Statistics Office, in the first seven months of 2017, natural disasters caused 75 fatalities and missing people and injured 77 others, while nearly 25,900 houses collapsed or were unroofed, in addition to 33,800 ha of rice and 18,100 ha of crops being flooded or damaged. Total damage during the reviewed period was estimated at VND2.3 trillion (US$101.2 million) but these figures do not include the damage caused by the flood on the morning of August 3, which left at least 35 people dead or missing in the mountainous Northern provinces. Severe weather events are worsening, with increasing severity, according to the National Hydro-Meteorological Service (NHMS). "By the end of 2015 and in early 2016, following a very warm winter, in January last year there was a record cold temperature, with 40 snowstorms in the north, including locations that have never recorded snow fall before, such as Hanoi’s Ba Vi Mountain. In 2017, the summer has been considered quite "cool", but there was a chain of six hot days in early June with the highest temperature recorded in many years," said NHMS Deputy General Director Le Thanh Hai. In addition to CC, increased economic activities, coupled with urbanisation and population displacement, have also created new challenges for forecasting. Dr. Bui Minh Tang, former director of the National Centre for Hydro-Meteorological Forecasting analysed that rainfall alone is simply a necessary condition and not enough to cause flash floods and landslides. "Enough" here means taking into account the slope, vegetation and local geological texture. 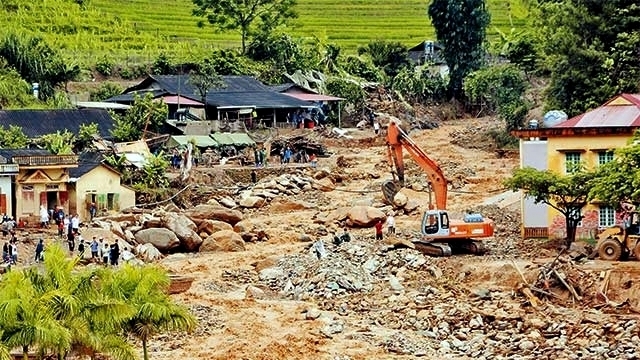 For example, in 2015, there was a huge landslide in Tuan Giao town, Dien Bien province and the cause for the incident was due to the local people spontaneously blocking streams to raise fish, creating a series of artificial reservoirs. As the floods arrived, upstream dams collapsed, creating a domino effect resulting in huge losses. Therefore, accurate forecasting for the location and time of occurrence of this dangerous phenomenon is impossible. It is a fact that, although the Law on Hydro-Meteorology has been in effect since July 1, 2016 and has impacted on all aspects of hydro-meteorological activities, forecasting quality has not yet been improved. This work depends on many factors such as the type of weather phenomena, monitoring equipment system, and the capacity and qualifications of forecasting staff. As for droughts and salinity intrusion, it is possible to predict up to 5-6 months in advance, but for typhoons and floods warnings can only be given 2-3 days in advance. Even with the recent flash floods and landslides occurring in Yen Bai and Son La provinces, warnings can only be anticipated 6-12 hours beforehand. "The farther away the forecast is, the lower the reliability is, while for the “near” forecasts, if the warnings do not reach the affected parties in a timely manner, they will not make sense. Meanwhile, in localities, especially those at grassroots level such as communes, wards and townships in remote areas, the staff in charge of communication, warning of natural calamities, and evacuation are often changed and have not been specialised yet," Le Thanh Hai shared as soon as he returned from the town of Muong La, Son La province after the floods in early August. 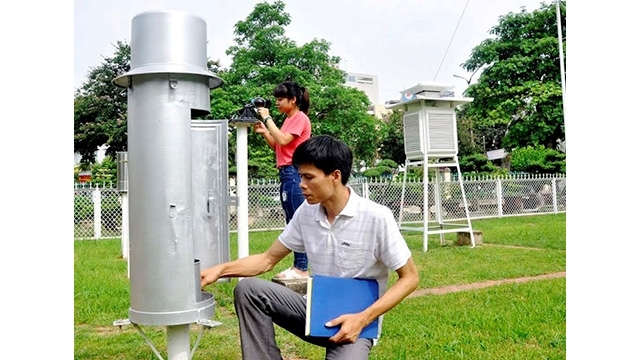 Officials at Vinh Phuc province’s Hydro-Meteorological Station monitor weather changes. Hai's concern is grounded in the fact that the warnings and forecasts are only part of the whole chain of responses to weather hazards and natural disasters. It is worth mentioning that while CC causes more frequent and severe rare weather phenomena to occur, the high risk areas are still inhabited by local people. What is the reason for this paradox? The core reason is that land use planning is inadequate and has yet to include the increasing risk of natural disasters due to CC, even in urban areas, not mention in villages in remote areas. According to statistics released by the Ministry of Construction, by the end of the Q1 2017, the rate of elaboration and approval of new urban planning was only around 35% (from 33% in 2015). Another significant cause is that the spontaneous residence and production activities of local people have not been controlled effectively by the local governments. Meanwhile, the construction and operation of a separate risk warning system for "sensitive" areas, often including just under a dozen households with 5-7 roofs, costs tens of thousands billion dong, which is, therefore, unfeasible. The less costly solution is to displace and relocate people to safe areas. The effectiveness of natural disaster prevention and mitigation, of course, is also determined by specific and on-the-spot response solutions, on the basis of prior human and material preparation. “Four on-site” (on-site forces, on-site command, on-site means and on-site logistics), along with "three readiness" (active prevention, timely response and rapid and effective handling), have always proved their effectiveness, but it is clearly easier said than done. Participating in the prevention and control of Typhoon Merbok in the northern central provinces last June, an official from a local department of agriculture and rural development commented that although these localities frequently have to withstand storms and floods, there are still unfortunate damages caused by unreasonable solutions. For example, quite a considerable number of boats had been brought to shore to avoid the storm, but due to improper anchoring, they collided, causing great damages during the storm. Furthermore, the veteran recalled that when the historic Storm Linda swept into the South in 1997, many fishermen were unfortunately killed because of the mental abstinence of wearing a jacket on board, making them unable to withstand the storm. It can be seen that, in the context of increasingly fierce and unpredictable CC, it is necessary to have joint efforts from the entire response "chain" to improve mitigation effectiveness due to natural disasters, with the implementation of a comprehensive set of solutions, from macro to micro levels.